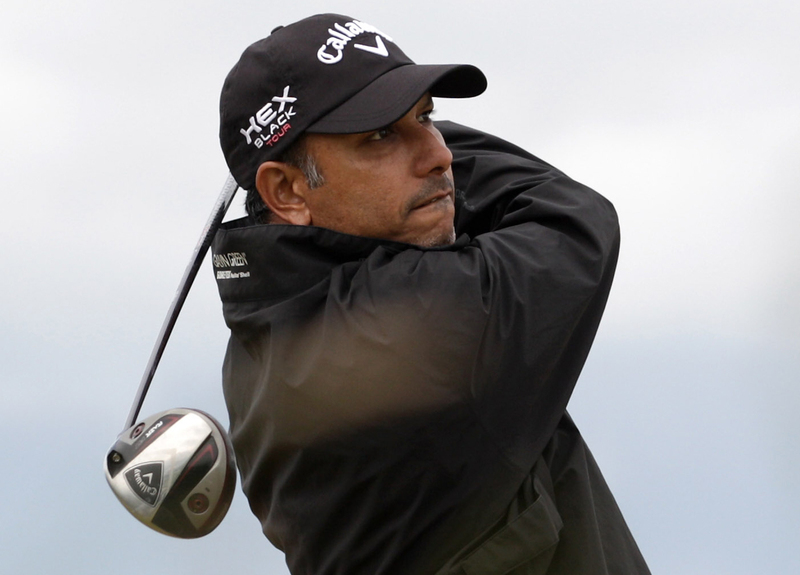 (AP) INVERNESS, Scotland - Jeev Milkha Singh beat Francesco Molinari in a playoff Sunday to win the Scottish Open and secure a late berth in next week's British Open. A final-round meltdown by local hope Marc Warren left Singh and Molinari tied at 17-under 271. The 40-year-old Indian won by draining a 15-foot putt for birdie on No. 18. Singh, the son of an Olympic 400-meter runner, shot a bogey-free 5-under 67 to tie for the lowest round of the day. Warren and overnight leader Molinari (72) dropped shots down a tough closing stretch into the wind. "I was just enjoying a nice cup of tea and some chocolate cake," Singh said of his hour-long wait for the late starters to finish. "I said to myself that I'd see the finish and then leave for the airport. But as the chocolate cake went down, it got exciting out on the course." Warren, playing in the second-to-last group and also seeking that one remaining berth in the British Open, led by three shots with six holes remaining. But he faltered under pressure and dropped four strokes in the final four holes. He finished tied for third with Alexander Noren of Sweden (70) at 16 under. "It's going to be a long drive home tonight," said Warren, who was being cheered on by Scottish First Minister Alex Salmond. "I'm a little bit disappointed to be not only missing out on the Scottish Open but the Open as well." Warren's collapse left Molinari in front as the Italian attempted a wire-to-wire victory after a dominant week in the Scottish Highlands. He bogeyed No. 15, though, and needed a par-saving putt at the 18th to force the playoff. Molinari's approach from the middle of the fairway at the first extra hole landed at the back of the green, and his long putt came up well short, leaving Singh an opportunity he didn't waste. By winning his first title in over four years, Singh not only will climb back into the top 100 but will play at the British Open  staged at Royal Lytham & St. Annes starting Thursday  for the only the second time in his 19-year professional career. "I was going to go back to India and spend some time with the family," said Singh, who claimed his fourth European Tour victory. "I think God has been kind. I'm very fortunate." After three opening rounds of very low scoring, Castle Stuart finally bared its teeth Sunday. A fierce westerly wind and heavy rain at times proved too much for top-ranked Luke Donald (73) and Phil Mickelson (74), who both finished tied for 16th at 12 under.